Many forts of different categories have been built all across Maharashtra. The main aim to build small forts was for administrative and defence purpose. 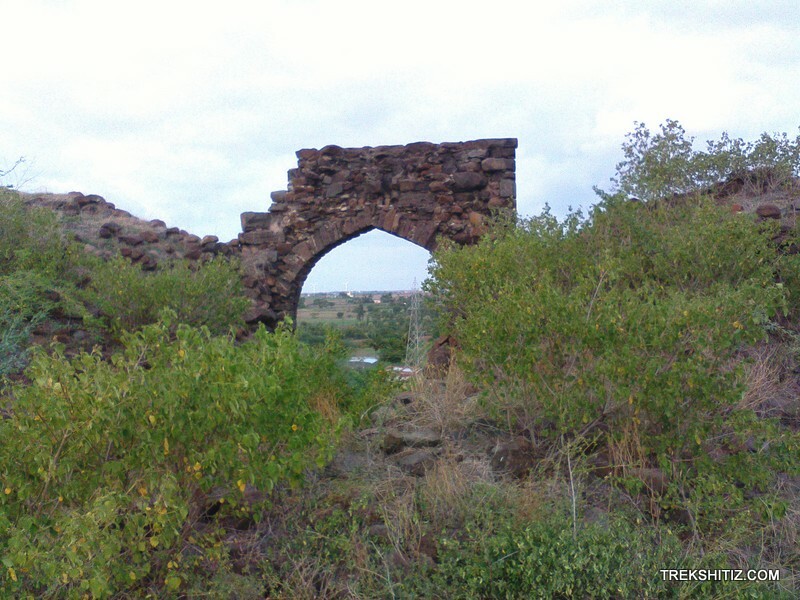 Ramdurg fort is one of its kind which was built in the 17th century by Dafale, the commander of Bijapur. The size and amenities of the fort indicate that the main purpose of this fort to serve for administrative purpose. On the hill in Rampur village, there is an ancient temple of Lord Shiva built in Hemadpanti architecture style. Thus this place has been seeing frequent visitors since long time even before the fort was built. Also this hill being the only one in the region it helped to have a bird�s view of the nearby areas which made it a good choice for fort location. One can alight to Sangli or Miraj by train and visit Rampur fort and Old Panhala by hiring a private vehicle. The large entrance of the fort stands facing eastwards. Its main arc is still intact. There are some steps carved ins tone opposite to it. The fortification wall and bastions of the fort are still intact. The fort wall is built by placing stones one upon another and are sealed by the locally available white clay mud. There is a temple of Lord Shiva facing southwards to the right side of the fort entrance. While approaching the temple one can spot some stones lying by the road which belong to the temple�s structure. The main hall of this temple is now in ruins and has no remaining marks. Its scattered pieces could be seen all over the fort. The four decorative carved pillars of the temple hall are still intact and the structure of the hall could be well imagined by those pillars. The arc of the temple premise has beautiful carvings and the door strip has an idol of Lord Ganesh. The roof above the Shivlinga has been inscribed by beautiful floral carvings. After visiting the temple proceed towards the flag bastion opposite to it. This bastion is in ruins now. From here one can see the whole Rampur village and the nearby regions. We can circumnavigate by this fort wall after descending from the bastion. After reaching the back side of the temple we come across a series of stones lying around. It indicates that there must have been a structure here. On the southern side of the fort there is a built in water tank and to the northern side there is a built wall. There is a special path built in the fort wall to reach this the built in water tank on the fort. This path was between the fort wall and the bastion to the north. Due to poor condition of the fort wall and the bastions this route has been blocked by the falling stones of the structure. It requires 30 minutes to visit the entire fort. One has to reach Jat village which is the Taluka place in Sangli district. Jat is 83 kms from Sangli and 80 kms from Miraj both via Daflapur route. The diversion for Rampur village lies 3 kms from Jat on the Jat-Daflapur road. State transport buses are available from Jat and Sangli and one can alight at the Rampur junction. Moving ahead towards the village from the junction we can see the fort vested on the hill. Proper road is available till the school premises behind which the fort stands. The path behind the school takes us to the fort facing the water tanks. After reaching these tanks we come across a doorway to the right. Continue walking towards this door by the unpaved road which takes around 5 minutes. From the Rampur junction it takes hardly 35 minutes to reach the fort and one can take a private vehicle till the water tanks.